Be the first to share your favorite memory, photo or story of Magdalena. This memorial page is dedicated for family, friends and future generations to celebrate the life of their loved one. 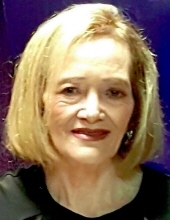 Magdalena Castro, age 65, of Aurora, IL, peacefully passed away on Saturday, March 23, 2019 in her home surrounded by her loving family. She was born October 15, 1953 in Mexico the daughter of the late Rafael and Maria (Aguiñiga) Valerio. Magdalena worked as a Machinist for Aurora Bearing until her retirement in 2018. She was a regular attendant at St. Therese church in Aurora, IL for many years. Magdalena loved her plants, and gardening, but most of all she loved her grandchildren. She is survived by her two children; Maria Castro, and Gilberto (Natasha) Castro of Aurora, IL; two grandchildren, Maximus Rocha, and Roman Castro; four sisters, and six brothers. She was preceded in death by her parents; husband Gilberto Castro Sr. and son in law, Rodolfo Rocha Jr. There will be a visitation on Thursday, March 28, 2019 from 4:30 PM until 8:30 PM at DUNN FAMILY FUNERAL HOME with CREMATORY 1801 S. Douglas Rd, Oswego, IL 60543. A burial mass will be on Friday March 29, 2019 at 9:00 AM at St. Therese Catholic Church 271 N. Farnsworth Ave. Aurora, IL 60505. To send flowers or a remembrance gift to the family of Magdalena Castro, please visit our Tribute Store. "Email Address" would like to share the life celebration of Magdalena Castro. Click on the "link" to go to share a favorite memory or leave a condolence message for the family.